Olivia and her brother Henry return to the deteriorating family cabin they have just inherited. There they wrestle with Grandpa’s old stories, an opportunistic real estate developer, a monster muskie, and each other. This place, familiar but not ordinary, is infused with memories. The results of the reunion are both fantastic and disastrous. Rock Lake was first performed as a staged reading in November 2002 at the Northfield (MN) Arts Guild Theater as part of their “Theater Afield” program. It was funded in part by the Southeastern Minnesota Arts Council. For script perusal and/or royalty agreements, contact Christine Kallman. 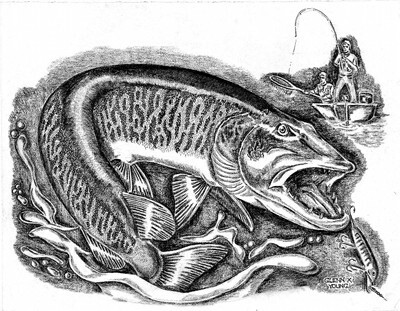 Graphic: “Muskie fish esox masquinongy and fisherman line art drawing on paper” by Young, Glenn K, U.S. Fish and Wildlife Service. Public Domain via Wikimedia Commons.